Years ago, Ariadne Delon Scott was riding a mountain bike on a trail, misjudged a turn, flipped upside down and crashed. Ariadne Scott, bicycle program coordinator at Stanford. Turning students who think wearing a helmet is “geeky” into believers is one of the goals of Parking & Transportation’s bicycling program, which collaborates on bike safety programs with many departments, including Campus Planning, Residential Education, Public Safety, Bechtel International Center, Vaden Health Center, Stanford Medical School, Graduate School of Business and the d. School. 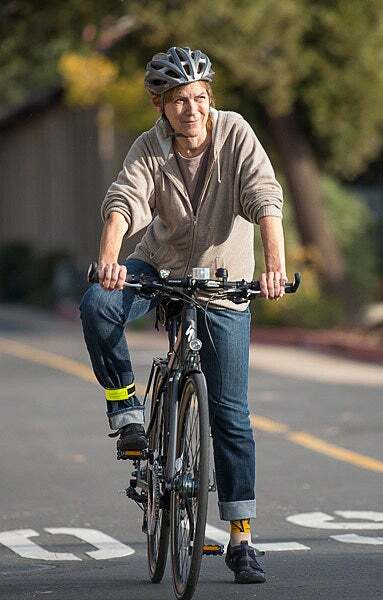 These days, Scott rides a steel gray Specialized bicycle – she once worked for the company, which is based in nearby Morgan Hill – for the commute to campus from her home in Los Altos. “It’s a more European-style bike that has integrated lights that run on a generator, a bike bell and a bike rack that I can hang saddlebags on – and load up with groceries on my way home,” she said. Scott rejoined Stanford in 2008, after working at Specialized Bike Components for five years. She had served as the university’s bike program coordinator from 2001 to 2003. While her first stint focused on infrastructure – such as bike racks – her second has focused on strengthening educational outreach and partnerships. Scott, who hasn’t owned a car for 22 years, said she tries to model good behavior by always wearing a bike helmet. When she is talking about bike helmets to undergraduate students at Stanford, she uses graduate students as models of better behavior. In the university’s 2012 commute survey, 11 percent of undergraduates who ride bikes on campus said they “always” wore a bicycle helmet, compared with 40 percent of graduate students who do. “It will be interesting to interview students after the Bike Safety Dorm Challenge to see what convinced them to wear a helmet,” Scott said. To follow the rules of the road that apply to bicyclists under the California Vehicle Code. To wear a bike helmet for every ride, even short trips. To respect the rights of all road users, including motorists and pedestrians, in an effort to promote safety and generate goodwill. The dorm with the highest percentage of pledges and the dorm with the highest overall number of student pledges will each win a free charter bus trip to Tahoe. The deadline for this year’s challenge is Dec. 14. So far, more than 860 students have taken the pledge. Scott said students who wear helmets seem to have had “some sort of epiphany” and decided they wanted to protect their brains – like the students living in Larkin, an all-frosh house, who decorated their black bike helmets with “I (heart) my Larkin lobes” stickers. Money should not be an impediment to wearing a bike helmet, Scott said, because several programs on campus provide steep discounts. Kali Lindsay, ’12, who suffered a traumatic brain injury in a campus bike crash – and recovered – championed a program in 2011 to subsidize helmets in frosh dorms. Freshmen can now buy helmets for only $5 each with a subsidy provided by Parking & Transportation Services, Public Safety, Residential Education and Risk Management. Under a program offered by Parking & Transportation Services, Public Safety and The Campus Bike Shop, students can buy helmets for $20 – a 30 percent discount. Scott said the shop sells more than 2,500 helmets a year. Scott said students are more likely to wear helmets because their friends are wearing them or because they heard a story about a friend who crashed. Scott said the university is always looking for ways to boost helmet use on campus. On Oct. 30, Provost John Etchemendy and Medical School Dean Philip Pizzo stood on the corner of Santa Teresa Street and Lomita Drive with members of the Department of Public Safety flagging down bareheaded bikers. One deputy passed out Halloween candy. Another, coupons for steeply discounted bicycle helmets. The Leland Stanford Junior Marching Band encouraged students to wear helmets during a halftime show at this year’s Homecoming football game. With more than 13,000 bicycles on campus any given day, Stanford is like a small city, a place where bicyclists, pedestrians and motorists all need to practice common courtesy and respect to ensure safety for all. In the past two years, Stanford has created several new bikeways for bicyclists alongside pedestrian pathways and sidewalks, Scott said. One new bike lane runs down the center of the Tresidder Union parking lot, where pedestrians now claim the pathway between two rows of green hedges. Another connects the Serra Mall bike path with a curving lane – framed by beds of lavender – that leads to the Li Ka Shing Center for Learning and Knowledge. Another connects Lomita Mall – between Santa Teresa Street and the Mitchell Earth Sciences Building – with Panama Mall, where bicyclists can turn left and continue on another two-way bike lane toward the Science and Engineering Quad. The most recent improvement is at the intersection of Galvez and Serra. It has been converted into a four-way stop to provide more visibility for motorists, buses, pedestrians and bicyclists. Scott said students still ask, “If there’s no traffic, do I still have to stop? We try to teach them to think of themselves as ‘driving’ their bikes,” she said. Scott said the most common bike citations are handed out for not stopping at stop signs; not using headlights at night; not yielding to pedestrians; and wearing headphones covering both ears. All are violations of California law, which only requires helmets for riders under age 18. Which brings her back to bike helmets. In bike safety presentations, Scott reminds students that most bike crashes occur within one to three miles from home. So a helmet is always a good idea. Scott said ” helmet hair” is one of the top reasons why students – as well as university employees – don’t wear helmets. “We just have to make helmet hair ‘cool’,” she said. Scott said suggestions on turning students into bike helmet believers are always welcome at bike-information@stanford.edu.